American manufacturers Audio Precision are best known for their range of sophisticated analogue and digital audio test and measurement equipment — and I have used an APx515 test system for my technical reviews in this magazine for many years. The Oregon‑based company currently produce a portfolio of six different audio analysers, and over the last 30 years or so Audio Precision have helped countless audio engineers and manufacturers design, test and validate the world’s best audio equipment. However, there is more to the audio world than testing equipment with physical analogue or digital inputs and outputs — acoustic testing is also critically important for many manufacturers, and that process inherently relies upon absolutely accurate and reliable measurement microphones. Not surprisingly, then, Audio Precision have recently launched their own assortment of high‑quality calibrated microphones, all based on industry‑standard interchangeable half‑inch and quarter‑inch pre‑polarised (electret) capsules with dedicated impedance‑converter/preamp bodies. The whole system is compliant with the TEDS and IEC 60194 standards for measurement microphones. Interesting though this development is to acoustics engineers, I imagine few readers of Sound On Sound are likely to get very excited about a test and measurement microphone system... Nevertheless, as the Danish test and measurement company Brüel & Kjær discovered in the mid‑1980s, precision measurement microphones can sometimes serve equally well as very high‑quality and absolutely faithful studio recording microphones too. In fact, it was the burgeoning recording studio market for B&K’s mics that led, in 1992, to the creation of DPA Microphones, specifically to market and develop the classic 4006 omnidirectional mic (and related models) for recording applications. So the potential of a similar role for AP’s new measurement mics is an interesting one well worth exploring. To that end, Audio Precision sent me a pair of 376M03 System microphones for evaluation, with each microphone comprising a 377M32 half‑inch capsule and a 426M16 phantom‑powered body — the latter containing the impedance converter and balanced output driver, of course. If I was asked to describe the general appearance of the 376M03 system, I’d say it looks like the love‑child resulting from a dark night in a quiet mic cupboard containing both Earthworks and DPA microphones! With the quarter‑inch capsule fitted the Earthworks resemblance is even stronger. The complete dual‑mic kit, comprising two 376M03 mics with rubber mounts, was supplied in a compact foam‑lined plastic case which, although protecting the mics quite adequately, isn’t what most studios would expect for an outlay of over $2500. Neumann would supply a polished hardwood case, and DPA a very robust and air‑tight Peli case! Audio Precision don’t offer the 376M03 in matched pairs, although the precisely calibrated nature of these mics renders that idea irrelevant anyway — and a very comprehensive calibration report is provided with each mic, detailing its sensitivity to two decimal figures at 82 spot frequencies between 20Hz and 39.811kHz! I expected the included mic mounts to have 5/8‑inch threads, but I was a little surprised that 3/8‑inch adapters weren’t included for European mic stands. Also stored neatly in dedicated slots within the foam case was a pair of conical stainless‑steel adaptors to allow the attachment of standard quarter‑inch microphone capsule inserts (although none were supplied). In case you were wondering, the primary attraction of a smaller capsule is the ability to capture much higher frequencies, and the Audio Precision 377M33 quarter‑inch capsule manages a flat response up to 100kHz. It can also accommodate SPLs up to 164dB (at 3 percent THD), although the inevitable trade‑off with such a small capsule diameter is a relatively high self‑noise figure which, in this case, reaches 40dBA. For the review system, though, the supplied 377M32 half‑inch omnidirectional capsules maintain a flat frequency response between 3Hz and 40kHz within a ±3dB tolerance (or 5Hz to 16kHz ±1dB). With a larger capsule the self‑noise figure is commensurately lower, at 22dBA, and the maximum SPL capability is 150dB (for 3 percent THD). 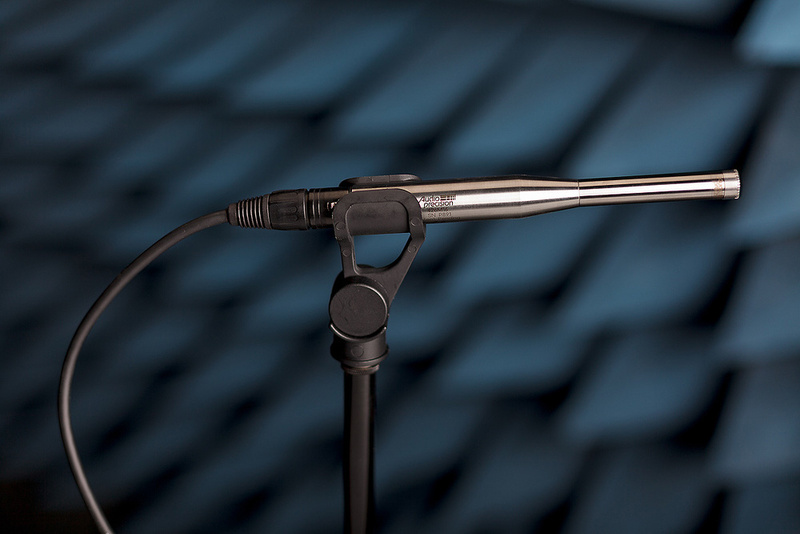 The microphone’s sensitivity is given as 12.6mV/Pa, which is fairly conventional for a high‑quality studio electret microphone. The mic operates on standard phantom supplies of 48, 24 or even 12 Volts, drawing 6.5mA of current. That’s surprisingly on the high side, although still comfortably within the 48V phantom specifications. Usually, the reason for a higher current through the impedance converter and output amplifier is to try to reduce semiconductor noise, but the DPA 4006A manages a lower self‑noise with only 2.8mA of phantom current. I wondered if it was because the DPA mic has an impedance‑balanced output with a single output driver stage, rather than a symmetrical drive requiring two output drivers, but the Audio Precision mic also uses an impedance‑balanced output configuration, so I’m not sure why it is such a thirsty design. 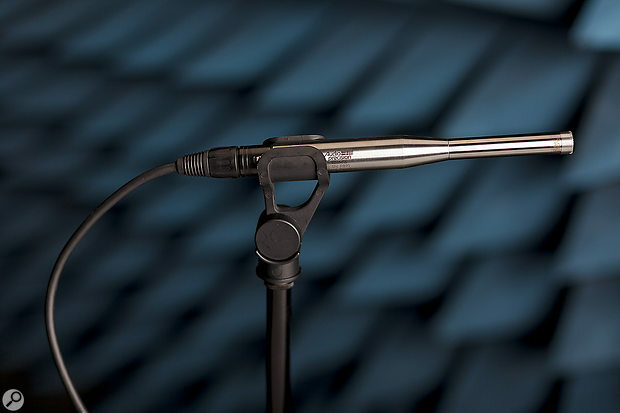 The whole mic body is made from polished stainless steel, and the cartridge employs a stainless alloy diaphragm. Perhaps not surprisingly, the replaceable protective grid’s radial slots and centre hole look to be machined in a very similar arrangement to the free‑field grid on DPA’s 4006. But then it is designed to deliver a flat response in the free‑field too (ie. reasonably close to a sound source directly on axis). The overall length (with the half‑inch capsule fitted) is 174mm (6.85 inches) and the diameter at the XLR connector is 20mm (0.79 inches), but the body starts to taper about 75mm up from the connector, and narrows to the 12.5mm capsule stalk by 100mm up. The mic itself weighs just 188 grams. As you might expect from a microphone designed as a measurement mic, the 376M03 sounds extremely neutral and analytical. The mic is about 4dB less sensitive and about 5dB noisier than a DPA 4006A (borrowed from a friend for this comparison as it is the most obvious and direct competitor). The Audio Precision mic is very detailed and revealing, of course, and has a massively extended — although not overblown or exaggerated — bottom end, coupled with a very clean, clear high‑end and a fabulously transparent mid‑range. If pressed, I’d opine that the DPA 4006A sounds marginally brighter above 10kHz than the Audio Precision mic, but this is negligible in all practical applications and would be completely unnoticeable without a direct and carefully matched comparison. I didn’t have any available sources to test the microphone’s maximum SPL capability, but both mics sounded equally clean and distortion‑free in all my comparative tests, and the Audio Precision mic has a claimed dynamic range of 128dB, which is 4dB more than the 4006A. However, this difference is partly because the DPA mic is specified with a maximum SPL (of 139dB) at 1 percent distortion, whereas Audio Precision chose to measure their microphone’s 150dB peak SPL limit at 3 percent THD instead — making simple comparisons impossible. In all of my tests, the Audio Precision mic delivered a very comparable performance to the DPA 4006A (once the sensitivity difference had been compensated), and from a sound quality and character point of view I’d be very happy to use it in all the situations where I might normally be tempted to reach for the 4006A — especially as the Audio Precision mic is roughly $600 less expensive in the USA. However, against that, the DPA model comes with interchangeable grids to equalise the capsule for diffuse‑field and close‑miking applications, and can also be fitted with a variety of nose‑cones and different spheres to alter the mic’s polar pattern, greatly extending the versatility of the DPA mic. None of these options are currently available for Audio Precision’s alternative. Another consideration is the mic’s name; any sound assistant will know what you’re talking about when you ask them to rig a 4006, and it’s a lot easier to rattle off the DPA’s name than 376M03... Shallow though it may be, I also fear the packaging may count against the Audio Precision mic somewhat. I’d certainly feel a lot happier with my uber‑expensive stereo mics protected in a secure, waterproof Peli case, rather than a cheap plastic case with a slightly dubious catch. Of course, packaging, accessories and model names can be developed over time, but the bottom line is that Audio Precision are off to a very good start indeed with the 373M03. This is a well‑built, attractive mic with a fabulously neutral, detailed and precisely analytical sound quality, which definitely compares favourably to the industry standard (if such a thing exists) DPA 4006A. The obvious direct competitor is DPA’s 4006A, although that model has a wide range of sound‑modifying accessories (grids, spheres, cones etc.) and different preamp configurations which afford considerable versatility. The DPA 2006A models make lower‑cost alternatives. The Earthworks QTC range of microphones could also be considered. A very neutral, transparent and analytical sound character. The case does its job, but isn’t attractive for a mic this expensive. A range of accessories are required to afford the studio versatility this mic deserves. An interesting foray into the studio recording world for Audio Precision, but it’s not the first time that a test and measurement company has found interest in its measurement mics from the recording world.